3. 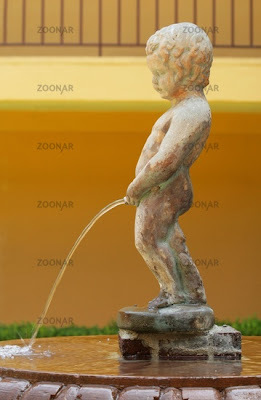 The patient produced urine. Anecdotes like this can lead us to the conclusion that the furosemide produced the improvement, even if we have been giving many other treatments along with the Lasix. We can use logic to back up that conclusion. 1. CHF is fluid in the lungs. 2. CHF is too much fluid. 3. Getting rid of the fluid gets rid of the problem. 4. The patient improved, so the logic must be sound. But is the logic sound? Is the conclusion justified or are we seeing what we want to see? The way we find out is by studying patients with similar enough presentations that they are treated the same way, except that not all patients are given Lasix. When we study the results of furosemide on CHF, we see that the things we have been told about IV Lasix are not true. Hypothesis #1. Acute CHF patients are overloaded with fluid. We have to remove the fluid to save them. CHF = Pee or die! This hypothesis was tested – all the way back in 1978, but the myth continues. 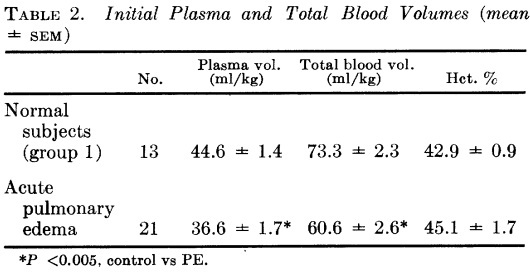 The normal patients had 22% more total plasma volume. The normal patients had 21% more total blood volume. The need to remove fluids is based on what? It is interesting that this study was of patients treated with oxygen, morphine, and furosemide. Only oxygen is still important in the acute treatment of CHF/ADHF. Hypothesis #2. IV Lasix almost immediately causes vasodilation. IV Lasix almost immediately causes vasoconstriction. This hypothesis was tested – in 1985, but this myth also continues. The use of intravenous furosemide in patients with chronic congestive heart failure, although well established, can promote further clinical hemodynamic deterioration during the first 20 minutes. Lasix raises blood pressure in emergency treatment of CHF. Hypothesis #3. IV Lasix improves outcomes for acute CHF patients. IV Lasix does not improve outcomes for acute CHF patients. This hypothesis was also tested a long time ago (in 1987), and at other times, but the myth persists longer than the patients treated with Lasix. If we can eliminate a treatment and the outcomes of patients do not get worse, where is the benefit from the treatment? Why expose the patient to the side effects of a treatment, if the patient is not expected to benefit from the treatment? Free Full Text Download from Circulation in PDF format. Acute vasoconstrictor response to intravenous furosemide in patients with chronic congestive heart failure. Activation of the neurohumoral axis. Ann Intern Med. 1985 Jul;103(1):1-6. What is the role of the renal system in CHF? Since the question came from a paramedic, the use of diuretics for chronic CHF (Congestive Heart Failure) is not relevant, except that the Acute CHF/ADHF (Acute Decompensated Heart Failure) may be brought on by poor management of chronic CHF. volume changes during acute pulmonary edema differ from those which were observed during chronic congestive heart failure. What is the role of the renal system in Acute CHF? That is the right place to start. This Golden Hour of acute CHF/ADHF is just as much a myth as the Golden Hour of trauma. 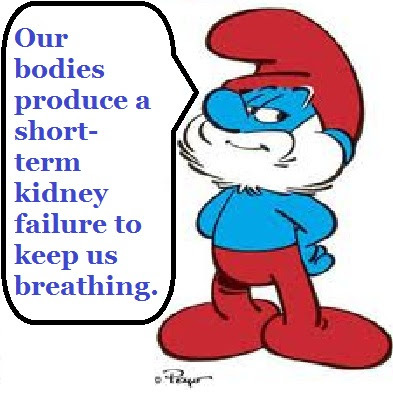 Stress -> Increased work for a weak heart -> Fluid backup in the lungs -> Shunting fluid away from the organs not essential in an emergency – the liver, spleen, intestines, stomach, kidneys . . . . Improvement -> Decreased work for a weak heart -> Fluid removal from the lungs -> Resuming fluid flow to the organs not essential in an emergency – the liver, spleen, intestines, stomach, kidneys . . . . In ADHF/acute CHF, the body shuts down circulation to the renal system. After the patient improves, the renal system begins to work again. In acute CHF, there is no significant role for the renal system. Since the renal system has no significant role in acute CHF/ADHF, diuretics should not have any significant role in the treatment of acute CHF/ADHF. EMS Expo had several excellent presentations and a lot of good company. One of my favorite topics was covered by one of my favorite doctors, Keith Wesley. Attend his presentations if you have the opportunity. For emergency treatment of CHF (Congestive Heart Failure), furosemide (Lasix – frusemide in Commonwealth countries) is a bad drug. If we use Lasix, are we killers? How much follow up do we get on our patients? How would we know if we dehydrate a patient and alter his electrolytes to the point of killing him? How would we know that the increase in blood pressure from Lasix is not making the CHF worse? What if we give Lasix to someone with asthma, or pneumonia, or a PE (Pulmonary Embolus), are we shortening the lives of these patients? How many of these patients die and how many might not die if they never received Lasix from EMS or from the ED? We do not know, but we would have to be insane to think that the number is zero – or even close to zero. In the kidneys, when there is good circulation to the kidneys – not in the patient who is pale, cool, and sweaty, because that is an indication of catecholamine release. Some claim that Lasix will cause vasodilation and that this will improve outcomes. Vasoconstriction is what kills CHF patients. In patients with chronic heart failure and especially in the presence of generalized edema, prior investigations have demonstrated either increases in intravascular volume17-19 or no consistent changes.20 During acute cardiogenic pulmonary edema, however, blood volume is more frequently reduced. In 16 of the 21 patients herein reported, the initial volume measured or calculated after onset of acute dyspnea demonstrated a lower than normal intravascular volume. To this extent, volume changes during acute pulmonary edema differ from those which were observed during chronic congestive heart failure. Chronic CHF and Acute CHF are not the same and should not be treated as if they are the same. Lasix is safe for chronic CHF. Lasix is not safe for acute CHF. We need to lower the blood pressure, but Lasix raises the blood pressure. Two patients became noticeably shorter of breath by 10 to 20 minutes after furosemide administration. We need to lower the heart rate, lower the blood pressure, and decrease the amount of work being done by the heart. Heart failure means that the heart is already having trouble. The solution is not to make the heart work harder. Activation of the sympathetic nervous system by intravenous furosemide treatment in patients with congestive heart failure is a new finding. The paper was written in 1985, but we keep hearing that Lasix is a vasodilator. Lasix raises heart rate in emergency treatment of CHF. Lasix decreases cardiac output in emergency treatment of CHF. Lasix makes acute CHF worse. For the first hour, or more, the effects of Lasix are dangerous to the patient. Lasix is a stress test that kills. We should listen to Dr. Wesley and stop killing our patients. 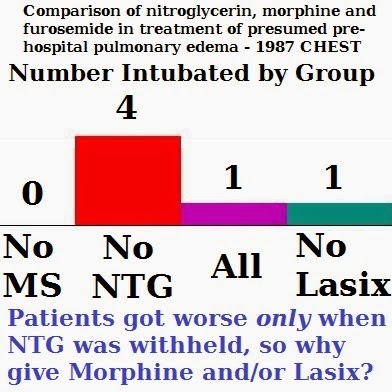 NTG (NiTroGlycerin – GTN GlycerylTriNitrate in Commonwealth countries) does the opposite of what Lasix does. Higher doses of NTG produce better outcomes. Also read NTG and the Hero Medic at Street Watch: Notes of a Paramedic, for a perspective on high dose NTG for acute CHF. 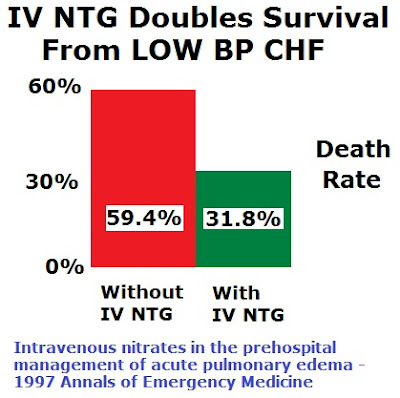 Would half a bottle of NTG tabs kill an acute CHF patient? No, and that is still much safer than giving Lasix to acute CHF patients. This lecture examines our better understanding of the pathophysiology of congestive heart failure and the history of its treatment. Old theories result in old therapies, and current research should guide us in providing better prehospital therapy for this deadly condition. We will explore the role of pharmacologic agents such as diuretics and nitrates, as well as the value of continuous positive airway pressure (CPAP) support. Conspiracy Theory Week – Truthers, Anecdotalists, and Creationists, Oh My! Conspiracy theorists come in many flavors of self-deception, but they aren’t really that different from the typical true believer in anything else. I have been writing about myths that we continue to use as standards of care, in spite of a lack of evidence. These are based on the same belief that are behind the myths being pushed by the 9/11 truthers. The simplest argument against the truthers is that they blame the Bush administration. The same Bush administration that went to war with Iraq, but did not plant any weapons of mass destruction. Are we supposed to believe that thousands of people would murder thousands of Americans based on where they were when the planes hit, but we could not get a much smaller number of people to frame Saddam Hussein – a guy who is easy to hate. Not just that, but the conspiracy is supposed to have been carried out in the first year of the first term of President Bush, while the absence of a conspiracy of weapons of mass destruction took place years later, after they had much more time to plan. I know it because of Screwy Idea X.
Screwy Idea X may be true, may be partially true, may be completely false, or may be completely unrelated. You have to prove that Screwy Idea X is false. If Screwy Idea X is false, will it be easy to prove it is false? If it is not easy to prove that Screwy Idea X is false, does that mean that anecdote X is true? The burden of proof should not be on the person who says, Screwy Idea X is ridiculous. 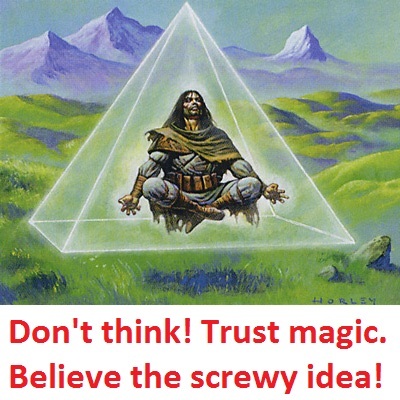 If you can’t prove that Screwy Idea X is false, that proves that Screwy Idea X is true. Conspiracy theorists and denialists work on the same principle. There is never enough evidence to prove their idea is wrong. As long as they can claim that there is a tiny possibility that they are right, that is their proof that they are right. As long as they can claim that there is a tiny possibility that others are wrong, that is their proof that others are wrong. Vaccines have saved millions of lives and are probably the safest medications we have, but what if your child has an extremely rare adverse reaction? No, autism is not caused by vaccines. Alternative medicine is better than real medicine, because of _______. There are many problems with real medicine. I write about the problems – I don’t ignore the problems. Alternative medicine pushers ignore their problems and only criticize the problems of real medicine. Alternative medicine is pretending that an unknown treatment has been kept hidden by a conspiracy of Big Pharma and it really works. Except that the evidence consistently shows that alternative medicine does not perform any better than placebo. Alternative medicine is big business and the business is fraud. We need to get rid of the prescription and over-the-counter medicines that don’t work. We do not need to add more medicines that don’t work. Creationism is real and evolution is a lie because of conspiracy X. Even though plenty of religions do not see any conflict between their holy books and evolution. Individual preachers will claim that a literal interpretation is essential, but only when it supports what they preach. If the religious do not agree that 6 Day Creationism is real, and there is no evidence that 6 Day Creationism is real, then why should anyone believe that 6 Day Creationism is science? We accept the crackpot idea because the true believer is charismatic. Charisma can cover up a lot of flaws, even flaws as ridiculous as what I have already covered. In medicine, we have our own true believers. Bleeding to get rid of bad humors. Spinal immobilization for mechanism of injury. Rotating tourniquets for CHF (because people with heart failure don’t mind a little amputation). Furosemide (frusemide, brand name Lasix) moves fluid from the lungs to the kidneys. If we give pain medicine, the patient will stop breathing. Even though epinephrine causes heart failure, it is the best solution to a heart that has stopped. Not just epinephrine for cardiac arrest – vasopressin, norepinephrine, phenylephrine, amiodarone, lidocaine, and magnesium. Maybe the 2015 ACLS Guidelines will be truly evidence-based and will NOT include any medications. Sunday, I wrote about a doctor claiming that there is a screwy compelling idea that demonstrates that oxygen is good, regardless of the lack of evidence. He also claims that since there is not perfect proof that oxygen is harmful, that is PROOF that oxygen is good. If it helps just one patient, that justifies killing other patients. Monday, I wrote about a doctor claiming that there is a screwy compelling idea that demonstrates that spinal immobilization is good, regardless of the lack of evidence. He also claims that since there is not perfect proof that spinal immobilization is harmful, that is PROOF that spinal immobilization is good. If it helps just one patient, that justifies disabling other patients. Tuesday, I wrote about a bunch of doctors (the AHA – American Heart Association – and others) claiming that there is a screwy compelling idea that demonstrates that ventilation is good, regardless of the lack of evidence. They also claim that since there is not perfect proof that ventilation is harmful, that is PROOF that ventilation is good. If it helps just one patient, that justifies preventing the resuscitation of other patients. I didn’t write anything on Wednesday. I was working on something long for Thursday (even the title was long). Thursday, I wrote about a bunch of doctors (including the AHA) claiming that there is a screwy compelling idea that demonstrates that tPA is good, regardless of the lack of quality of the evidence. They also claim that since there is not perfect proof that tPA is harmful, that is PROOF that tPA is good hours and hours later. If it helps just one patient, that justifies causing bleeding in the brains of other patients. Friday, I wrote about the way the standard of care is perceived. All of these people I mentioned are claiming that their pet treatments, about which they are very biased, should not be affected by any negative evidence and why the evidence in favor of their pet therapy is all that we should pay attention to. Ignore the flaws of the positive research – assuming there is any positive research. Belief. Only pay attention to the flaws of the negative research. Willful ignorance. This is not the way to do what is best for our patients. If it helps just one patient, that justifies all of the harm to the other patients. No, I am just simplifying the excuses for the lack of evidence to support their belief. This is just an example of a logical fallacy. Why are we making the heart work harder in heart failure? Is the harm from furosemide (Lasix – frusemide in Commonwealth countries) anything new? This study is looking at the effects of furosemide in patients with chronic CHF (Congestive Heart Failure), not acute exacerbations of CHF. This should have led to studies of the effects of furosemide on acute CHF. After all, in 1985 everyone seems to have been using furosemide for acute CHF. Our clinical observation of what appeared to be acute worsening of symptoms after intravenous furosemide administration in some patients with severe heart failure led us to study the sequential hemodynamic and neurohumoral responses in a series of such patients. We have seen patients get worse. It is 1985. We are not the first to study this, but emergency medicine and EMS will not really cut back on the use of furosemide for acute CHF until after 2000 – more than a decade and a half. All patients had clinical evidence of congestive heart failure for at least 6 months and were hospitalized for heart failure. No patient had frank pulmonary edema. The average ejection fraction, as measured by radionuclide angiography in 14 patients, was 22 ± 5% (SD). Each patient was on a sodium-restricted diet, and all had symptoms typical of New York Heart Association class III to IV. These were sick patients at baseline. It is not clear if these patients were already in the hospital for treatment of CHF or if they were recruited as outpatients. No patients had heart attacks within the previous 4 months. Digitalis and diuretics were used chronically by all patients, but none had used vasodilator therapy for at least 72 hours before the study. Most patients were receiving chronic furosemide therapy, but the usual morning dose was withheld until the study (usually midmorning). Is IV (IntraVenous) furosemide worse than oral furosemide? When treating acute CHF, do we really care? Each patient then received an average dose of 1.3 ± 0.6 mg/kg body weight of furosemide given over 1 to 2 minutes. For a 70 kg patient, that would be 91 mg ± 42 mg (between 49 mg and 133 mg [between 0.7 mg/kg and 1.9 mg/kg]) over one to two minutes. Not a huge dose, but not a tiny dose, either. If the patient is healthy enough for us to give them a drug that makes them sicker, are they surviving their illness or are they just surviving our abuse? Immediately increased heart rate. How much worse would it become if the patient had acute pulmonary edema? Immediately decreased stroke volume. How much worse would it become if the patient had acute pulmonary edema? Immediately increased systemic vascular resistance. How much worse would it become if the patient had acute pulmonary edema? If the heart rate gets worse, the stroke volume gets worse, and the systemic vascular resistance gets worse, then we expect the blood pressure to get worse. Is the blood pressure going to get worse by dropping or by increasing? The most effective medical treatment for acute pulmonary edema is vasodilators – especially high-dose NTG (NiTroGlycerin – GTN GlycerylTriNitrate in Commonwealth countries). Furosemide is doing exactly the opposite of what we want it to do. An increase in plasma arginine vasopressin levels after furosemide administration is also a new finding. In other words – Standard Of Care. This deterioration may go largely unnoticed because such patients often are already dyspneic and show clinical improvement over the next hour. Maybe we need to pay more attention to what is going on with our patients, rather than paying attention to killer traditions. We could get similar results with a bolus of epinephrine, but we usually wait until the patient is dead to do that. Maybe the only reason we don’t give furosemide in cardiac arrest is that we are afraid that it might make the patient pee. These patients were not having acute attacks of CHF before receiving furosemide. These patients got a lot worse before they returned to their baseline. Is there any reason to believe that the furosemide behaves any better when the CHF patient is already short of breath and his lungs are filling with fluid? The furosemide is supposed to work on the kidneys, but acute CHF patients have poor circulation to the kidneys, so even that is not likely to do anything until after the patient is much better. Other posts on furosemide (Lasix). CHF Treatment: Is Furosemide on the Way Out? There si a discussion of the inevitable elimination of furosemide from the emergency drug list for CHF/ADHF (Congestive Heart Failure/Acute Decompensated Heart Failure). The only real surprise is that it has taken this long. The problems with furosemide have been documented since the 1970s. This isn’t just a problem with CFH/ADHF. With the treatment of spontaneous pneumothorax, the problem has persisted, in spite of evidence, for even longer. What is crucially needed here is what should have been done 40 years ago, which is a randomized controlled study of conservative observational management of primary spontaneous pneumothorax against what is currently the best evidenced intervention which is pleural aspiration. Nitro, morphine and furosemide: they’ve been the Holy Trinity of emergent treatment of acute CHF since the 1960s, but does this cocktail actually work? Whatever the cause, CHFers rarely call EMS because their feet are swollen. They call because they can’t breathe, which is why we have traditionally considered CHF a cardiac disease disguised as a respiratory condition. The bulk of prehospital treatment of CHF is aimed at treating the primary clinical manifestation of left heart failure: cardiogenic acute pulmonary edema (APE). When their CHF/ADHF improves, their ankles will begin to improve, too. But we should not worry about their ankles when they can’t breathe. They don’t breathe through their feet. This is why it is safe to use huge doses of NTG (NiTroGlycerin – GTN GlycerylTriNitrate in Commonwealth countries) for these patients, when they are hypertensive. A systolic pressure less than 100? But we’ll kill the patients! Actually, NTG is safe in much more hypotensive patients. We are supposed to be terrified of giving IV bolus NTG to hypotensive CHF/ADHF patients, but the death rate for hypotensive patients was cut in half by IV bolus NTG in this study. NTG is not a new drug, we have just been too afraid to use enough. Acute pulmonary edema, therefore, may likely be less of a fluid volume problem than a fluid distribution problem. There may be no excess accumulation of fluid needing to be diuresed; it is simply in the wrong place and needs to be distributed properly. Furosemide removes fluid, but only after the circulation returns to the kidneys. During critical illness, the body shunts circulation away from the kidneys. As with high-flow oxygen for chest pain, if the blood isn’t getting to the heart muscle, it does not matter how much oxygen is in the blood that isn’t getting where we want it. Like being in a traffic jam honking the horn, it may feel as if we are doing something, but we are only making things worse. I prefer to keep treatment simple. Giving a bunch of drugs in a short period of time is a good way to make things a lot worse. This is kind of like the person who makes large adjustments to four different settings on a ventilator, but without reassessing at any point until after adjusting everything. Several drugs with varying durations of effect can also be a bad idea. A lot of NTG. If you are uncomfortable, start off slowly, but if the blood pressure does not start to drop, keep increasing the dose. If this is CHF, small doses of NTG will probably have no effect on blood pressure. Expect the blood pressure to rise. CPAP (Continuous Positive Airway Pressure), which makes it difficult to give sublingual NTG, but does not stop us from giving IV NTG – either as an infusion, which requires a pump, or boluses of the same doses we give under the tongue. 1 mg to 2 mg at a time – repeated every 3 to 5 minutes until symptoms improve. Go read the full article. Kelly and Gene know what they are writing about. Spontaneous pneumothorax: time for some fresh air. Intern Med J. 2010 Mar;40(3):231-4. Review. An excellent, but mostly unappreciated, review of the problems with the Standard Of Care for spontaneous pneumothorax. Not that much different from the mythological treatment that persists in so many other areas of medicine. High dose nitroglycerin treatment in a patient with cardiac arrest: a case report. J Med Case Rep. 2009 Aug 10;3:8782. Doesn’t that study prove Lasix works? Could you elaborate a little bit on why you included this study? Was it just to point out that Lasix does not work the way many in EMS think it does? There are two reasons I chose this study. It provides evidence that the reason for giving furosemide (Lasix – frusemide in Commonwealth countries) to the unstable CHF/ADHF (Congestive Heart Failure/Acute Decompensated Heart Failure) patient is not valid. The other reason is the age of the article. We have a long history of ignoring the evidence that the problem is not too much fluid in the patients, but a problem of the fluid being in the wrong places. Or rather, that in EMS we are taught an incorrect mechanism for Lasix. I did not really address the possible mechanisms by which furosemide might work, but I will in looking at other research. Chronic CHF and acute CHF are not the same condition, even though they share many features. I don’t think furosemide works for patients with acute CHF. I think furosemide makes things worse for patients with acute CHF. I will write more about this using other articles, many of which have been around for decades, but have been ignored because too many of us just know it works. I understand why Lasix has largely fallen out of favor for the treatment of acute CHF, but reading through the actual study it seems like this supports the use of Lasix. Studies were performed in 21 patients, 11 men and 10 women, ranging from 44 to 83 (median 67) years in age. In 16 of the patients, PE was observed at the time of admission to the Center for the Critically Ill and in five patients, PE appeared during the course of in-patient care. Previous history of acute pulmonary edema was elicited in nine of the 21 patients; 11 patients had been treated with diuretics prior to the occurrence of acute pulmonary edema; and six patients had evidence of peripheral edema on admission. The initial set of measurements were obtained immediately after referral to the Center for the Critically Ill from either the emergency department or general medical services following onset of acute PE. Oxygen was the only agent administered prior to the initial set of measurements. This is something I did not pay attention to when writing the first post. These appear to be ICU (Intensive Care Unit) patients. I had mistakenly assumed these were ED (Emergency Department) patients. This also weakens the conclusions I was drawing from the study. I had been reading the Center for the Critically Ill as a fancy name for the ED. 11/21 patients. These patients had a very high rate of the pink, frothy sputum we were told to expect from CHF. In 11 patients, there was expectoration of frothy fluid. Whatever treatment was given to the patients in the ED does not appear to have helped, but we have no idea what the denominator is. Treatment included oxygen administered by rebreathing mask, ventimask, or nasal prongs in oxygen concentrations ranging from 28 to 60 (mean 40) %. After an initial set of measurements had been obtained, morphine sulfate was injected intravenously in bolus doses ranging from 2 to 5 mg with total dose ranging from 5 to 15 mg until acute anxiety was relieved. This is prior to any furosemide (maybe not the total doses of morphine, but the initial doses). If we wanted to see the effects of furosemide, there would be some control of any differences in treatment. There would be more documentation of differences. Bilateral moist rales and radiographic signs of grade 3 or 4 pulmonary edema, according to the criteria of Turner, Lau, and Jacobson,10 were documented in each instance. This suggests that there is good objective evidence that these patients really did have CHF, which is an important point. Furosemide was administered by intravenous bolus injection in amounts of 40 or 80 mg. Additional doses of 40 or 80 mg of furosemide were administered after 1 hour in the absence of a diuretic response. The total dose of furosemide during the initial 24 hours of management ranged from 40-160 (mean 71.4) mg.
How many patients did not have a diuretic response (make urine) in the first hour after receiving furosemide? We do not know, and the mean of 71.4 mg, with an initial dose of 40 or 80 mg and 40 or 80 mg increments, leaves a lot of room for speculation. Is that what happened? Did half of the patients receive repeat doses? As I stated, I am only speculating, but I could come up with a variety of dose combinations that would produce a similar total mean dose. The point is that this information is not helpful for evaluating the possible effect of furosemide. Why would patients not have a diuretic response for over an hour after furosemide? Isn’t furosemide supposed to act like Kryptonite (is there yellow Kryptonite?) to the fluid retention of CHF? Aren’t we supposed to keep urinals and bedpans ready for these patients? If the patient is shunting blood away from the less critical organs, during times of critical illness, how is the furosemide supposed to get to the kidneys quickly? In patients with chronic heart failure and especially in the presence of generalized edema, prior investigations have demonstrated either increases in intravascular volume17-19 or no consistent changes.20 During acute cardiogenic pulmonary edema, however, blood volume is more frequently reduced. If the patient is stable, drawing off this excess water seems to help to prevent fluid from leaking into the lungs. Should we assume that furosemide preferentially removes fluid from the lungs in patients who are already intravascularly volume depleted? Accordingly, plasma water had been removed from the intravascular compartment. The evidence points to extravasation of fluid from the intravascular compartment that is low in colloid content. The likelihood that this represents, at least in part, fluid which is extravasated into the lung is consistent with observations on the protein content and colloid osmotic pressure of pulmonary edema fluid. If the solution were removal of the patients’ already low intravascular volume and furosemide could be shown to have a rapid diuretic effect, furosemide would probably be useful. Can these patients really wait more than an hour to breathe? If furosemide could be shown to produce some sort of vasodilation, furosemide would probably be useful, even if the diuresis were not the method. At another time, I will write about the way furosemide causes vasoconstriction – which is the opposite of the effect we are told furosemide produces. For evaluating the efficacy of furosemide, this study has too many unknowns. The authors never intended to study the efficacy of furosemide, so that is not a problem of poor study design. Their study was designed to find out something else. The same study as above. I am putting some speculation down here, since it does take up a lot of room and may not be of interest to many people. We do not know how many had an initial dose of 40 mg. If 20 of the patients received 40 mg and one patient received 80 mg, then the mean initial dose would be 41.9 mg. If 20 of the patients received 40 mg and one patient received 80 mg, and every patient received one repeat of their initial dose (20 x 40 mg and 1 x 80 mg), then the mean total dose would be 83.8 mg. Most of the patients could have received repeat doses after an hour of no diuresis. On the other hand, if one patient received 40 mg and 20 of the patients received 80 mg, then the mean initial dose would be 78.1 mg. Each initial 40 mg dose would make the total mean dose almost 2 mg higher. What if 5/21 received 80 mg initially and no further doses; 11/21 received 40 mg and each received a second 40 mg dose; and 5/21 received only a 40 mg initial dose? This would produce a total mean dose of 70.5 mg, which is close to the actual total mean dose of 71.4 mg.
Is that what happened? Did half of the patients receive repeat doses? As I stated, I am only speculating, but I could come up with a variety of dose combinations that would produce a similar total mean dose. The point is that this information is not helpful for evaluating the possible effect of the medication. Edited 12-27-2018 to correct link to what I am responding to and because this does constitute a correction of a misreading of the original paper. I added the following to what I am responding to. These appear to be ICU (Intensive Care Unit) patients. I had mistakenly assumed these were ED (Emergency Department) patients. This also weakens the conclusions I was drawing from the study. I had been misreading the Center for the Critically Ill as a fancy name for the ED (A&E in Commonwealth countries).